If you’re like me and have more than a few connected devices at home, then you’re probably constantly fumbling in and out of lots of different apps, with way too many passwords, and you’re the only one in the house that can make your home work.It can feel overwhelming and more than a little complicated. We get it. And we’ve got you covered. All devices in one view: You can keep track of everything in one place without needing to flip between apps. The new app organizes your devices by room so that you can easily control your speakers, lights, cameras, TVs and more than 10,000 connected devices that work with your Google Assistant. That means there are more than 200 million devices in the U.S. that can be controlled with your voice, many of them already in your home. Just note that controlling devices like a thermostat or lights requires smart thermostats or smart lights. Check in from anywhere: You’re even in control while you’re away from home—simply open the Google Home app to check in your home and make sure things are the way you want them—like making sure your thermostat is set to the right temperature when you get home. * Now you can have convenience and peace of mind, no matter where you are. 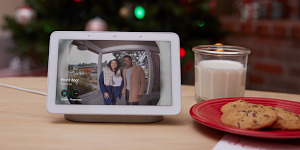 Access for everyone in your home: Now, everyone under the same roof can control smart devices in your home, they just need the Google Home app on their phone. That means one app to get it all done—add, remove and control devices. We also added a feature for those of us who are on call to answer tech questions for our less-savvy family members that lets you control multiple homes. That means you can manage your parents’ home or help that cousin who’s having trouble setting up their smart home. The updated Home app will be rolling out to iOS and Android users this week. And if you’re new to the Google Home family, you can download it on Google Play and in the App Store.